A third guy appears: a small Taiwanese company named IGS, creates on his own arcade hardware (PolyGame Master, a modern MVS-based system) a remarkable game named Martial Masters. This is a great feat for an editor who is still a beginner in the Versus Fighting section (only three trials in the past), as the result is spectacular, inspiring a lot from Capcom's productions but offering its own characters and game mechanics. The entry in the new millennium marks a bit the Versus Fighting final blast, with some big titles coming, the end of an era, and a few surprises. The 2d genre is getting less and less popular, only a few diehards still publish new episodes from their legendary sagas, but few 'real' news appear. The arrival of the PS2 will even score a flood of titles using 3D, and it will take some years before the sacrosanct 2d is honoured again. The year 2000, for the time, marks a real brake for the arcade world in general. The consoles have won the war: the evolution of technology and the advent of cheap and powerful home systems allowed editors to provide games equalling in quality the arcade titles, and this has caused decline of the legendary game rooms. Present everywhere in the world, these places gradually closed one after the other, leaving only the biggest halls located in the biggest cities. Many firms began to diversify, some others completely migrated to other sectors of activity, and some others literally closed their doors. Sign of the times, the giant SNK declare bankrupcy by the end of this year. Several strategic mistakes these last years plus the consequences of the increasing piracy bootlegs in the arcades cost a lot to the editor, and all this result in the company closing its doors, yet with more than twenty years of existence. Always it is that SNK gratifies the fans with the last episode of its mythical saga, The King of Fighters 2000. Taking back the 99' episode strikers' system, the editor signs here one of the best games in the series. It's also the end of the war with Capcom, and peace between these two giants of the arcade takes the form of the most anticipated crossover of all time: Capcom VS SNK: Millennium Fight 2000. The game is developed on Naomi and Dreamcast and later ported on Playstation 1 and 2, before experiencing a very successful sequel the next year. Capcom realizes the dream of millions of players by putting in competition the most charismatic heroes of the two schools in a real 2D fighting game: bravo! Capcom VS SNK, the dream became reality. The year 2000 also sees the release of Marvel VS Capcom 2 and Guilty Gear X, two other bombs of the Versus Fighting world. The second episode of the first Guilty packs some good improvements and finally met success with the public. A new series also comes from Takara teams - who realized in the past several adaptations of SNK games - and it's Tatsunoko Fight. The soft includes the superhero from the eponymous anime company in a 2D fighting game rather fun, but far from revolutionary. With Guilty Gear X, Arc System's saga conquers its public. Here have scrolled under your eyes twenty years of VS fighting history, and so much things happened... You have probably noticed that many games or even series have been omitted here. This article is wanting historical and concise, I bothered to retain only the great sagas and the big names that have marked the history of video game, as well as titles having had a special meaning, as well as the most emblematic for each period. The next decade to come would see the fighting game a little behind the most popular videogames. 3d action games, FPS, RPG, sports simulations, network games... a whole new generation of softs never seen in the past would surge to a world of new players. During this time, the big series like Tekken, Virtua Fighter or Soulcalibur would have new episodes, as for 2d games, these will return a few years later at the forefront, although some sagas have lasted all this time. 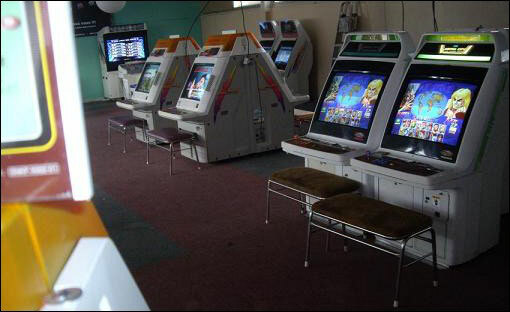 SNK rised from its ashes in 2001, under the name of SNK Playmore. The new company would continue its legendary sagas on the Neo Geo with two new Samurai Shodown and Kof until 2003. console would even welcome Power Instinct Matrimelee, the latest installment in the saga of Atlus, and SVC Chaos, another Capcom/SNK crossover , this time made by the Playmore programmers. The 16-bit surrenders in 2004 after Samurai Spirits Zero Special, with the official announcement of the definitive cessation of games development on Neo Geo in favor of the Atomiswave, a much more recent hardware from Sammy. This latter host Kof Neowave, Kof XI and Samurai Spirits VI, which will be adapted on home consoles. Playmore perpetuates SNK's legendary sagas... with more or less success. Naruto and Bleach invade home systems. Guilty Gear saga would have very many sequels and adaptations, while Capcom stops altogether Street Fighter and Marvel series for a few years. New fighting games inspired with popular manga appear and encounter a great success, like Naruto, Bleach or One Piece, which have dozens of episodes released during only a few years. Bandai has not remained on the side of the road and creates the Dragon Ball Z Budokai and DBZ Budokai Tenkaichi series, which become popular hits. The manga literally occupies the fighting game division for the first decade of this century. We mostly remember that the 3d is the top of the basket during this period, but an impressive turnaround will operate in 2008 in favor of 2D gameplay fighting games. Meanwhile, Arc System Works inject new energy to the genre by giving birth to BlazBlue - Calamity Trigger, which he publishes in parallel of Guilty Gear episodes. But Capcom makes a comeback on the front of the stage with Street Fighter IV, which gets a makeover with a beautiful high-definition 3D and a roster of twenty characters, while preserving the standard gameplay of its legendary Street Fighter II: the fun in the game is intact! These are two fabulous sets of arcade VS that enthusiasts players, and are ported to the 128-bit systems PlayStation 3 and Xbox 360 - winning significantly in popularity. Although SFIV is made 3D, the game retains a true 2d gameplay like his ancestors, and so does BlazBlue. The amount of games released is clearly no longer what it was by the nineties, but the quality at the rendez-vous. The craze is huge and puts the 2D VS Fighting at the taste of the day: the new series of Arcsoft generates sequels, while Capcom releases two evolutions to its game, Super Street Fighter IV and then the Arcade Edition'. Success is impressive for such an old genre, so much that the editor publishes shortly after Marvel VS Capcom 3, which is a frenzy involving a variety of characters from different games. Even Midway comes to the party with a new Mortal Kombat modeled on the pattern of SFIV: 3d graphics, 2d gameplay. And of course, incredible gore feat that made the saga famous is present, which entitles us to a superb episode packing controls and gameplay close to its illustrious ancestors. SNK who had done nothing remarkable since the death of the Neo Geo (except some very insipid sequels and compilations of past successes...) seems to rise from the ashes with The King of Fighters XIII, born fall 2011. The game features a first-order realization, a roster of thirty-three characters and gameplay worthy of its ancestors. The formula works, having Playmore communing with first-hours fans and also conquering a new audience, and of course competing with the new saga of his old rival. One thing is certain, the 2D Versus Fighting , the one and only, the real, the authentic, has survived to repeated assaults of 3D gameplay games and came back in the spotlight, more beautiful and legendary than ever. 2011 is indeed the year that sees the real fighting game coming back to the front of the stage, maybe for a long time! Thousands of titles have emerged, some remained totally unknown, others marked the memories forever; companies have lived and died in the fighting game world, and a whole universe was created around this theme. Capcom and SNK have been prominent players, but other companies such as Sega, Namco, Tecmo or Arc System Works have emerged as other big names in their wake. Still others have little or not counted, but you will have the opportunity to discover all of them by searching on the internet, or by visiting our COMPLETE LIST OF 2D VS FIGHTING GAMES, which contains only games based on 2D gameplay. - 1976: Heavyweight Champ Sega Prime Versus Fighting Game. - 1985: Yie Ar Kung Fu Konami lays the foundation of the modern game VS.
- 1991: Street Fighter II Capcom revolutionized the genre. - 1993: Sega Virtua Fighter performs the first fighting game in 3D. - 1994: The King of Fighters 94 (SNK) is the first Crossover, featuring 24 fighters and a technically advanced gameplay. - 1999: Capcom and SNK VS reaches the pinnacle of 2d Fighting, Garou Mark of the Wolves and Street Fighter III 3rd Strike. These two games mark the end of an era and the decline of the genre. - 2011 marks the return of VS Fighting on the front of the stage. Infancy during the late seventies, a shy breakthrough during the eighties, then a well defined peak in the first half of the nineties, followed by a sharp decline from 1996 to 2002. Since 2003, the figures have stabilized and production is relatively stable today. A well-established genre...? After the revival experienced by the world of VS fighting games in 2011, one can only imagine great things for the year 2012. 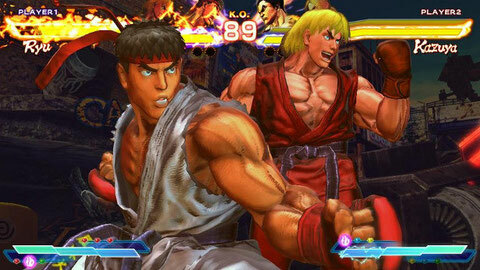 Among the titles previewed, Street Fighter VS Tekken is a promising new crossover by Capcom. Killer Instinct is possibly the next new revival to be made by Midway, but nothing is certain yet. Skullgirls with its particular graphics is also quite expected. Some monsters from 3d big franchises - which most returned to the 2d gameplay, aka 2.5D - are expected to arrive this year: Soulcalibur V is obviously highly anticipated by fans, but it will also count with Tekken Tag Tournament 2, Dead or Alive 5 and Virtua Fighter 5 on home systems... So ladies and gentlemen, prepare your arcade sticks: the fighting game has never been so alive! What will happen in 2012....?